Select your item: 952-1860 Perforated & Solid Assorted, 120/Pkg. 952-1862 Solid Partial Assorted, 12 each, 7-10, 48/Pkg 952-1856 Solid Partial, 7, UL, LR, 12/Pkg. 952-1857 Solid Partial, 8, UR, LL, 12/Pkg. 952-1858 Solid Partial, 9, Upper Anterior, 12/Pkg. 952-1859 Solid Partial, 10, Lower Anterior, 12/Pkg. 952-1736 Full & Partial Perforated Assorted, 120/Pkg. 952-1861 Perforated Full Assorted, 12 each, 1-6, 72/Pkg. 952-1850 Perforated Full, 1, Large Upper, 12/Pkg. 952-1851 Perforated Full, 2, Large Lower, 12/Pkg. 952-1852 Perforated Full, 3, Medium Upper, 12/Pkg. 952-1853 Perforated Full, 4, Medium Lower, 12/Pkg. 952-1854 Perforated Full, 5, Small Upper, 12/Pkg. 952-1855 Perforated Full, 6, Small Lower, 12/Pkg. 952-1735 Perforated Partial Assorted, 12 each, 7-10, 48/Pkg. 952-1730 Perforated Partial, 7, UL, LR, 12/Pkg. 952-1731 Perforated Partial, 8, UR, LL, 12/Pkg. 952-1732 Perforated Partial, 9, Upper Anterior, 12/Pkg. 952-1733 Perforated Partial, 10, Lower Anterior, 12/Pkg. 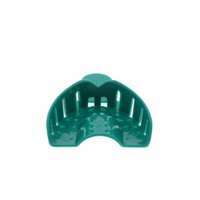 Darby's Disposable Impression Trays are an impact-resistant plastic. 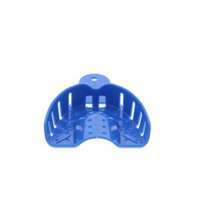 The trays are rigid, distortion-free, and compatible with a wide variety of impression materials. 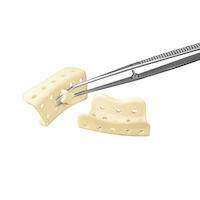 The perforations are designed to enhance consistent flow and retention. Perforated & Solid Assorted, 120/Pkg. Solid Partial, 7, UL, LR, 12/Pkg. Solid Partial, 8, UR, LL, 12/Pkg. Solid Partial, 9, Upper Anterior, 12/Pkg. Solid Partial, 10, Lower Anterior, 12/Pkg. Full & Partial Perforated Assorted, 120/Pkg. Perforated Full Assorted, 12 each, 1-6, 72/Pkg. Perforated Full, 1, Large Upper, 12/Pkg. Perforated Full, 2, Large Lower, 12/Pkg. 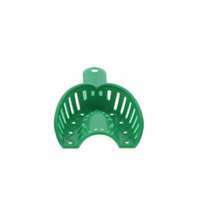 Perforated Full, 3, Medium Upper, 12/Pkg. Perforated Full, 4, Medium Lower, 12/Pkg. 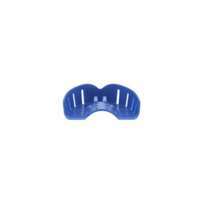 Perforated Full, 5, Small Upper, 12/Pkg. Perforated Full, 6, Small Lower, 12/Pkg. Perforated Partial Assorted, 12 each, 7-10, 48/Pkg. Perforated Partial, 7, UL, LR, 12/Pkg. Perforated Partial, 8, UR, LL, 12/Pkg. 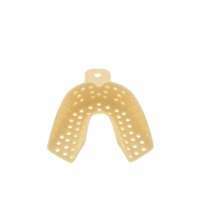 Perforated Partial, 9, Upper Anterior, 12/Pkg. Perforated Partial, 10, Lower Anterior, 12/Pkg.